The Bridge Pool continues to be one of the most popular and productive pools on the river. There were 5 anglers nymphing the pool yesterday around 2 pm when I crossed the bridge. It’s a great vantage point for spectators who can, with polaroid glasses, see where the fish are and watch trout take the nymph. In this photo the angler on the beach has just landed a trout. The angler at the head of the pool was hooking fish on a regular basis but failing to land fish – at least while I was watching. This morning I wandered upstream and the next photo is looking upstream over Cattle Rustlers where, from my viewpoint, I could see a lot of fish past Barlow’s pool and through to the lower Birches. There were fish here but no anglers. It is a beautiful day today – warm, calm, clear. Last week, and at times this week, the equin0xial gales have been present and casting is hard work, almost impossible for nymphing. It is Spring. The fish I have seen this week are good size and most anglers seem to have a fish in their basket. It was a ‘recreational release’ of water in the Tongariro last weekend and there is an interesting spike showing when it came through. DoC Press Release re restructuring. Last Update I copied Turiana Turia’s press release relating to DoC restructuring. The Department of Conservation is to set up new regional service centres in its Hamilton, Wellington and Christchurch offices as it moves to re-organise its systems for supporting conservation staff in the field. 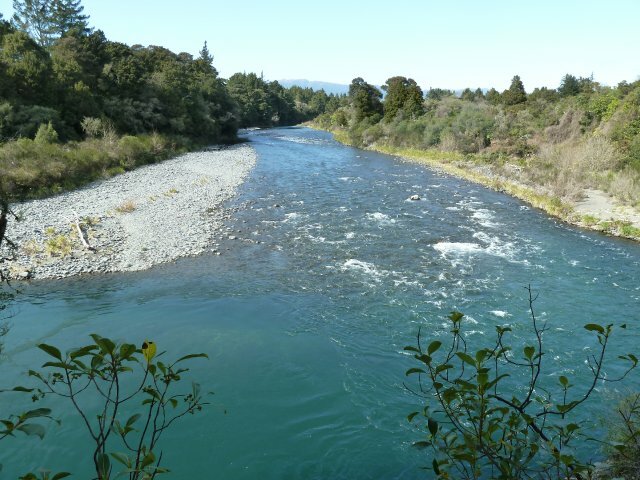 As a result a number of science and technical jobs have been cut from the Department of Conservation’s Whanganui, Taranaki and Turangi offices, and some new support roles will be consolidated in a new conservancy office in Taupo. The changes do not affect ranger positions in the Department’s area offices, or the location of the area offices. Relocations are due to the establishment as part of the wider departmental review of three service centres in Hamilton, Wellington and Christchurch, where service jobs will be created. “By moving the support staff from a regional base into professional groupings, the department would be able to provide more cost-effective systems and would gain a stronger national focus to its work” says Mr Coutts. These service jobs include roles in legal, planning, science, technical and communication positions, but not rangers. “The department is committed to maintaining services on the ground, and this review has been focussed on finding more cost effective ways to organise DOC’s systems for supporting the work of staff out in the field”, Mr Coutts says. For further information, please contact Damian Coutts, Conservator, Department of Conservation, Tongariro Whanganui and Taranaki Conservancy phone: 06 3492127 (work) or 027 2407893 (after hours). 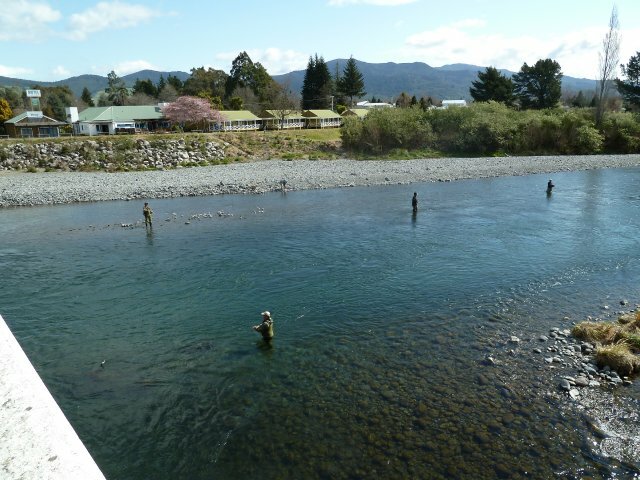 that the management of the fishery will continue from Turangi. that the operational staff will remain in Turangi therefore the restructuring will not be as severe as I reported. We have worked to form a good working relationship with the Department of Conservation and would be upset to lose the staff from here. 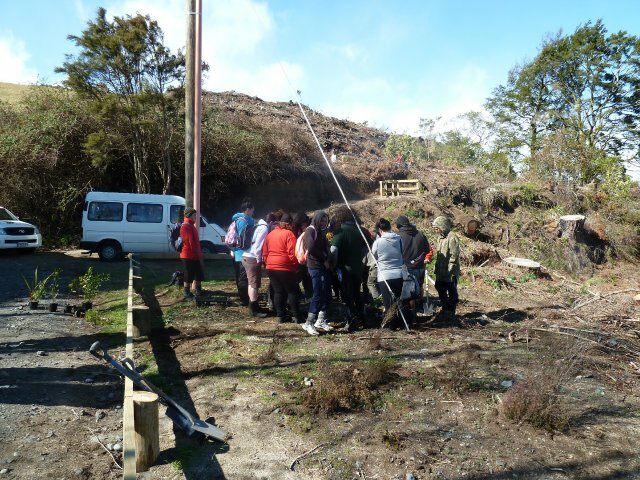 The lookout above the main road bridge has seen the beginning of planting with a good turn out from the local community and Te Kura Hirangi who are the subject of this photo. It was fine but the equinoxial gales were in full force making it difficult to stand at the top of the hill. Traps. The Blue Duck Trust has many traps on both sides of the river. I think they are doing excellent work eliminating pests. The traps I have looked at seem to be catching rats. Last week I fished into the evening at the top of the Reed Pool and watched a novel method of pest control. There were two anglers on the opposite side of the river to me. The one immediaely below me started thrashing the water with his rod and then made a grab at the water catching a rat by the tail which was swimming across the river. He then calmly waded out to the bank where he and his colleague considered how they would dispatch the vermin. An attempt at drowning didn’t seem to work but I feel assured that the rat was dispatched.